It's getting time to start making those lists and checking them twice! The holiday season is just around the corner, and the elves and I have been hard at work trying out some of the hottest toys this year! 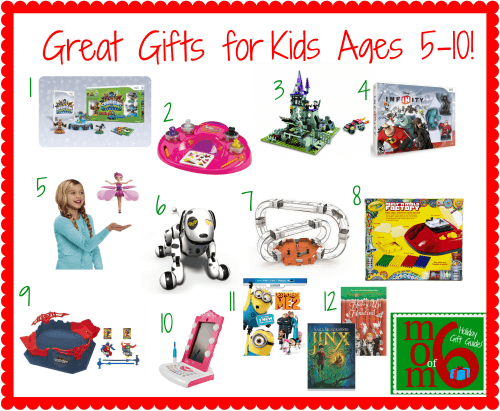 After careful consideration and consultation with my 6 minions- here's the Momof6 list of Great Gifts for Kids Ages 5-10! Skylanders SWAP Force is truly going to be one of the hottest toys this holiday season- and I can tell you that my kids absolutely love it! The game is fun for multiple ages because you can determine the level of play- from Easy on up to Nightmare Mode! 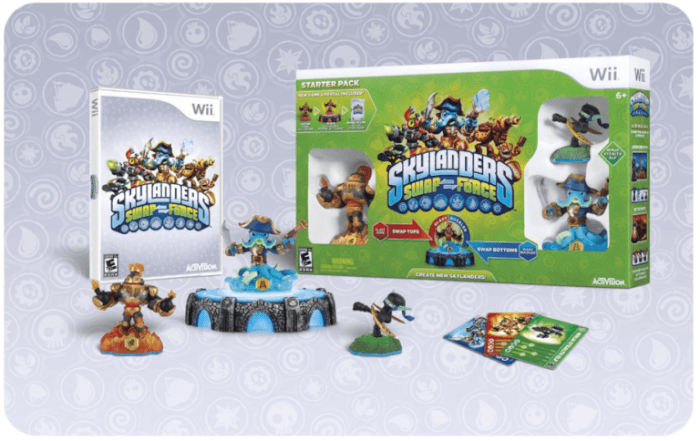 The storyline is great, and the best part is that you create the adventure as you go along because you use the Skylanders Portal to introduce new characters in the game to play with- and the Skylanders tops and bottoms swap out so you can create a new character with unique powers based on which top you placed with which bottom. This game has completely captured the imagination of my kids (especially my 7 and 10 year olds) and provides hours of fun! Available for the Wii, Wii U, XBox, XBox One, Playstation 3 and 4, and Nintendo 3DS. 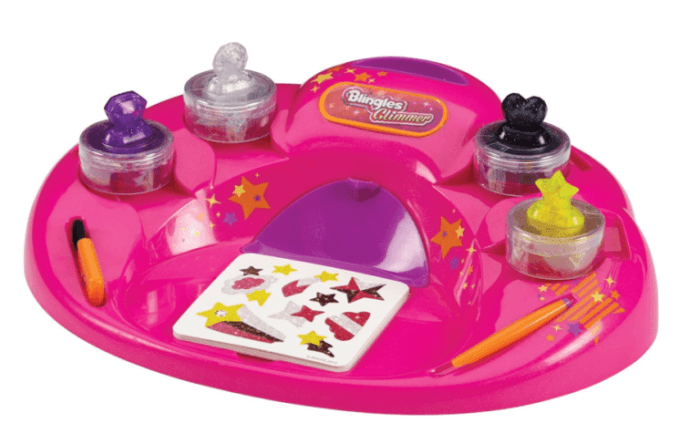 I love giving gifts to kids that are crafts or provide a way for them to create something, which is why I really liked this little “sticker studio”. Using the products from the Glimmer Glam Styler , my kids were able to create sparkly, blingy stickers to use to decorate their notebooks, and to dress-up notecards. I will admit that it does get a little messy- and it is best to put down newspapers or something on the table to catch all of the glitter that is bound to fall outside of the styler while the kids are working on their creations. But every life deserves a little glitter, doesn't it? My kids love to build. Especially to build things out of those little plastic blocks! Which is why they adore KRE-O building sets. 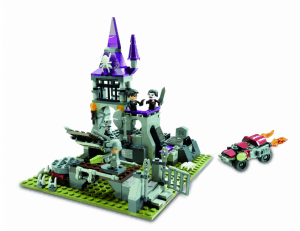 It allows them to create a really cool structure complete with little zombie guys to inhabit it- and this new KRE-O Haunted Hideaway set comes with a sonic motion brick that helps the little zombie guys to move! (It works with a gentle vibration that helps to move along the little figures). So cool! 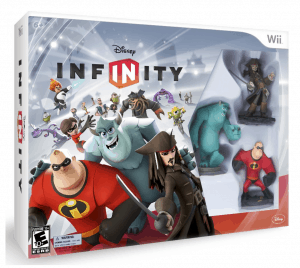 If your kids are really into Disney/Pixar characters and are just starting to get into video games- Disney Infinity would be a great gift! Featuring favorite characters like Sully, Mr. Incredible, and Jack Sparrow from Pirates of the Caribbean- players can allow their character to enter the game through the base system, and then can take them on adventures- play games, and really become the character in their own world. In Toybox mode, 2 players can play the game together- using characters from different movies- so Jack Sparrow can battle against Mr Incredible! The cool thing about Disney Infinity is that you can expand play by purchasing more Disney characters which creates more options for gameplay. I thought this was one of the coolest toys this year at the Toy Showcase that I attended! This sweet little fairy charges on her base, and when you push a button she rises in the air- and when you place your hand beneath her- she stays afloat moving with your hand wherever you direct her! It's like having your own Tinkerbell! 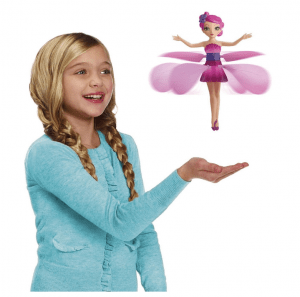 Flutterbye Fairy is absolutely magical for kids! Zoomer has been at the top of my daughter's wish list for weeks now! She is on her 97th letter to Santa, and he has literally been the first item listed ever single time! And while he does cost a pretty-penny- he is MUCH less expensive than getting a real puppy! And much easier to clean up after! But seriously- Zoomer acts a lot like a real puppy- he barks, he follows you around, he wants to play! 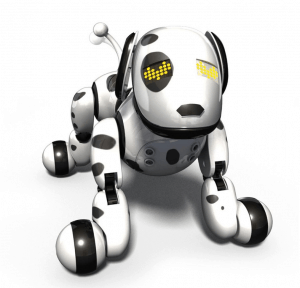 And you can teach him tricks like how to sit, roll over, and shake! My only worry about my daughter opening up Zoomer on Christmas morning is that everyone else is going to wish that they had asked for him too! If you ever wanted one of a gerbils that would climb around in one of those Habitrails systems the way I did as a kid (and my parents totally rejected that idea!) then you'll understand why I love the Hexbug Double Loop set! The little critters can climb walls (even upside down! )- enter and exit the loops and even run around on your coffee table- making it a blast for giggling kids to catch them and put them back in the loops again. 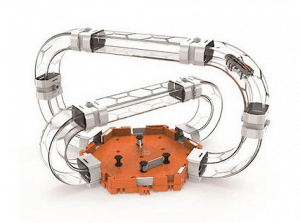 Multiple Hexbug V2 systems can be purchased and joined together to create a huge Hexbug environment! Have you ever done a craft with your kids that involves melting crayons and then pouring them into little molds so that they end up with this super funky multi-colored crayon that they can draw with? I love making these kinds of crafts with my kids- but playing with melted wax is more of a Mom-job which makes it less for fun for the kiddos. 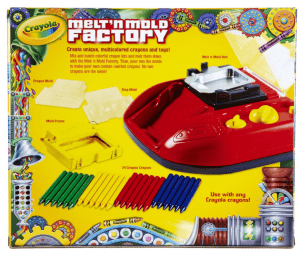 But that was until I found this awesome Crayola Melt ‘N Mold Factory ! The factory closes up and locks when you start the melting timer- so the hot wax is contained inside of the system where it can't burn your kids! The set comes with 2 molds- one to make crayon rings and one that just allows you to make new multi-colored crayons! Our factory has already seen hours of use! My boys had a great time trying out these awesome Beywarriors and allowing them to battle it out in their cool red octagon stadium! Kids rev-up their warriors using the ripcords to get them spinning like tops- and then release them into the arena to battle it out. 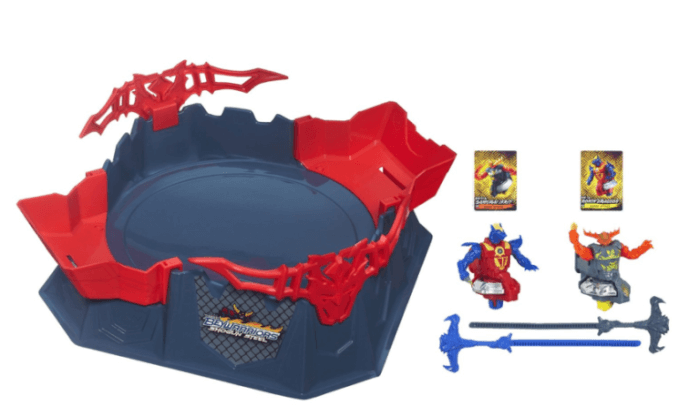 The cool thing about this set is that the kids can mix-and-match the Beyblade tops and Beywheelz bottoms to create their own ultimate Beywarrior! I love this Beywarriors Octagon Showdown because it is just good old-fashioned fun for the kids! My girls are really hoping that Santa puts this under the tree this year! 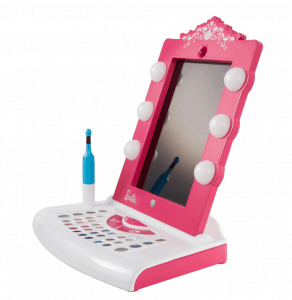 The Barbie Digital Makeover Mirror functions as a station top hold your iPad (or iPad Mini) device, and uses an app (that you'll have to download to your device) that works with your camera to show your little girl's face on the iPad and allows her to digitally apply makeup. (Thereby keeping her out of your makeup drawer!). The app is sophisticated enough to track your child as she moves, so her digital makeup moves along with her! Girls can make a scrapbook of all of their favorite makeup looks, or even email their glamour shots to Grandma! You know it was the BEST movie of the summer, right? So you have to buy it for your kids this holiday! 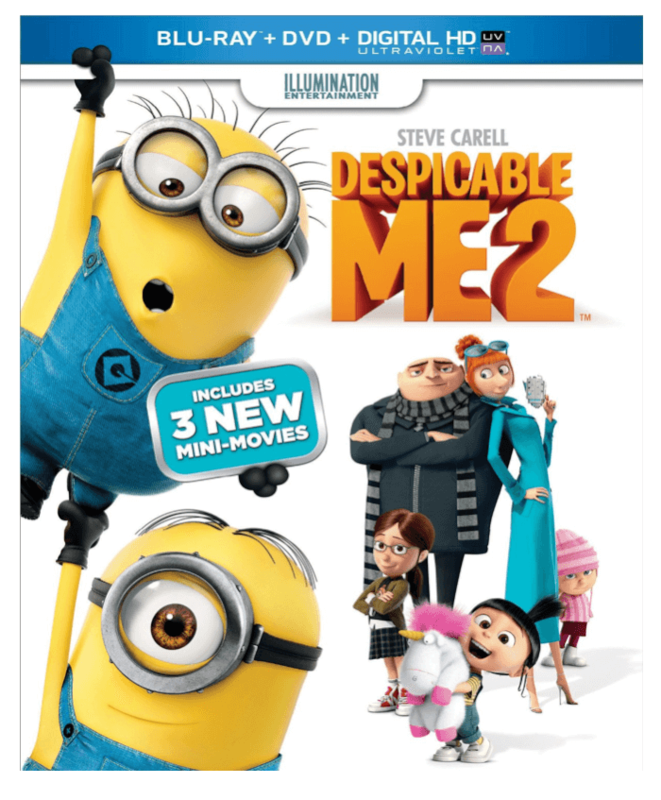 Despicable Me 2 will be released on December 10th and I am sure it will appear in many a kid's stocking this Christmas! 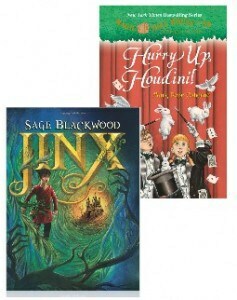 No holiday is complete without a few new great books for the kids! Amazon editors have compiled their list for Best Books 2013 for Kids Ages 6-8 as well as Best Books for Kids Ages 9-12 .While it's true that I will likely be buying these as Kindle books which can easily be read on their iPads by multiple kids at the same time, I will never stop giving books as holiday gifts! *all product links above are Amazon affiliate links. Thank you to the awesome folks at Hasbro, Blingles, Crayola, SpinMaster, Activision, Innovation First International, and Disney Interactive for providing product samples for testing as well as for our giveaway below! To celebrate the awesomeness of our Momof6 readers- we are giving away a Flutterbye Fairy to one lucky winner and a KRE-O Haunted Hideaway to another lucky winner! Enter below! (Giveaways open to US residents only please). What is your favorite 5-10 year old hoping for this holiday season? « Save $ and Earn Points While Shopping Online with MyPoints! Great list for holiday gifts and very nicely reviewed them in your video. I will get few for my nephew, who is 7 years age. Recently we have purchased a board game Pet Me for him, It is a multiplication and division board game. This game also involves, owning the pet and feeding them. He is totally crazy about this game. I think this game can make in to this list. My 3 yr old wants a Dora doll. Thanks for the list. I have a clear idea now on what they will be enjoying more this Christmas. I have a 6 year old girl and 10 year old boy who want everything they see. Both my girls want this flutterbye fairy. I wasnt going to get it for them because it had such mixed reviews on Amazon. I think they are getting a karaoke machine for Christmas. Believe it or not, my 8 year old daughter would like more matchbox cars in addition to the bounty of vehicles that her three older brothers gave her from when they were young. That being said, I think she would love the Flutterbye Fairy! The Flutterbye looks like a toy my grand daughter would like. I keep asking what she wants and she says she doesn’t know. Besides monster High I think she would love one of these. She is obsessed with American Girl doll clothes. Slow – that is me ha ha Thank you as always! My 6 yo daughter is hoping for a FurReal kitty. She has been begging for a real cat for a couple years now, but our current dog won’t allow it! Thanks for the list – there are a couple big ticket items that my youngest wants, and it is nice to hear good things about them to help me decide.